Long Beans are a legume, grown for its long, crisp and tender entirely edible pod. It’s part of the cowpea family and has its origins in China and South Asia where it is still lovingly cultivated and eaten. It is a vigorous grower in sub-tropical regions like Southeast Asia and Hawaii, perfect for vertical gardens as they grow on a vine that climbs, setting out two pods of beans per flower, usually ready for harvest in just 60 days. Contrary to its popular name, the bean usually reaches half a yard in length – still not bad at all! Red and yellow long bean varieties also make rare appearances in the farmers markets. Long beans are similar in taste to European varieties of green beans – like French green beans or haricot verts, but have a sturdiness that holds up well in stir fry and curries. Because both the pod and beans are eaten, it brings a lot of nutrition to your table: each 100 gram serving of long beans can provide 3 grams of protein (5% of daily requirement). It is also a great source of fiber, vitamins C and A, thiamin, riboflavin, iron, phosphorus, and potassium, folate, magnesium, and manganese. – Always wash your beans well. – Cut off ends. Quickest way is by grabbing the beans and pulling the ends together so that they are uniform and can be cut at once. Do on both sides. – Cut into desirable length. – Long beans are eaten most dry fried (Szechuan style with chili), stir fried, sauteed or steamed. They are also added to curries and stews. Chopped up fine they are a main ingredient in Thai style fish cake too. – They can also be eaten raw in salads. In Thai style salads, long beans are chopped and then bruised into the salad mix with other veggies, both to slightly tenderize and to help the bean harmonize with the other flavors. Often the whole salad is put into a pestle and massaged, or put into a ziplock bag and rolling pinned. Look for long beans feel heavy for its size, supple, flexible, and free of black spots or swollen pods. 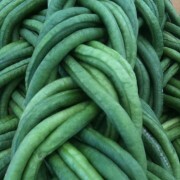 Most long beans you find in farmers markets are ready for eating. If you are looking for really tender beans for a recipe calling for raw, however, look for the shorter ones – 12-16 inches. Store unwashed in plastic bag in refrigerator for 5-6 days. Long beans can freeze well especially if you have a vacuum sealer to prevent freezer burn. To freeze, wash beans and allow to dry. After they are dry, cut stem ends off, then cut beans in half. Blanch beans in boiling water for 1 minute. Drain, package and freeze up to 6 months or so.